In September, 2014, the World Health Organization (part of the UN) released a report indicating that over 800,000 people, world-wide, commit suicide every year. That means about one person every 40 seconds, 24 hours a day, 365 days per year, tragically ends their life. Reasons and methods vary greatly, of course, but certainly the most significant contributor to the suicide rate is the epidemic of depression. In the United States, about 40,000 people commit suicide every year – again most as a result of depression. By the way, gathering suicide data is difficult because many suicides go unreported or countries simply don’t collect suicide data – or don’t do it effectively. So if anything, the 800,000 number is, perhaps, a dramatic understatement. In the same report, WHO indicates they are “committed” to reducing the global suicide rate by a whopping 10% by 2020. How they plan to accomplish even this anemic goal given the status-quo of diagnosis and methods of treatment is a mystery. Without an aggressive approach, using new technologies that could be widely employed in developed and underdeveloped areas – the WHO goal is meaningless. Part of the problem is that the current medications typically used to treat depression are expensive, not readily available in some locations, may need to be taken for a lifetime, and have side-effects (some serious) that can discourage use. Transcranial Direct Current Stimulation is a simple technology that has been shown to reduce or eliminate depression in many individuals. Treatment involves using a tDCS device for about 30 minutes a day for 30 to 60 days with an occasional follow-up treatment as needed. It also happens that tDCS is safe and easy to administer. A tDCS device is very simple to construct using readily available components – for perhaps $10 to $20 dollars – much less than the cost of a single month of anti-depressant pills. For a relatively small investment by the WHO, millions of tDCS devices could be built and distributed world-wide. In day long sessions, doctors, counselors, and other professionals (including an army of volunteers) could be trained to identify, screen, and treat depressive persons. The training could even be conducted over Skype, Google Hangout, or similar means, eliminating the cost and complexity of travel in certain areas. Once trained, the important work of markedly reducing the world-wide suicide rate – by identifying persons in need, teaching them how to treat themselves, and following up as needed to assure positive progress – could begin. Below are images of a simple tDCS device that could be cheaply constructed and made widely available to trained professionals and volunteers. 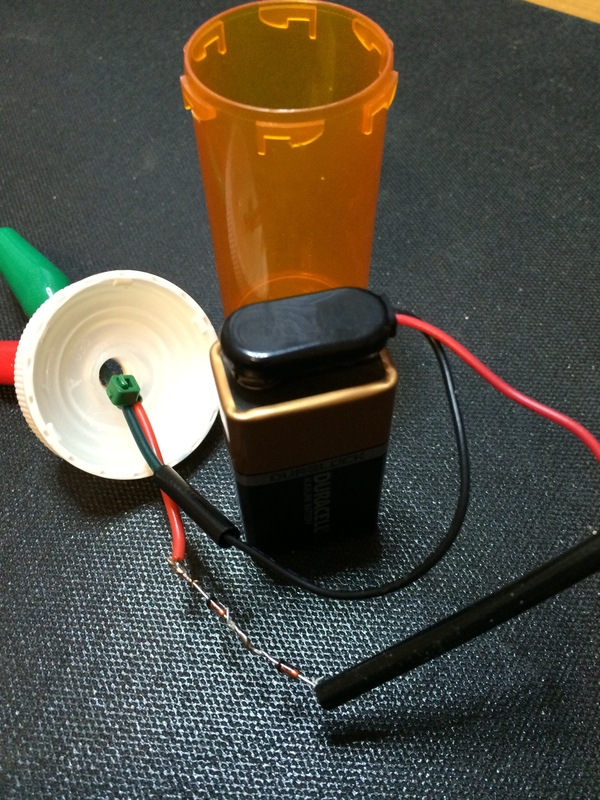 I purposely built the device components into a pill-bottle to drive home the point that a tDCS device can be small, cheap to build, and replace expensive, side-effect laden pills for many depression sufferers. The major components of this tDCS device (above) include a 9-volt battery, two one milliamp current limiting diodes, a pill-bottle for a case, two electrodes to place on the head, and a headband. This design uses two CRDs in series to make the device nearly failure-proof. Should one CRD fail, the second continues to limit treatment current to one milliamp. The CRDs are at the bottom of the picture, shown just before covering them with heat-shrink tubing. 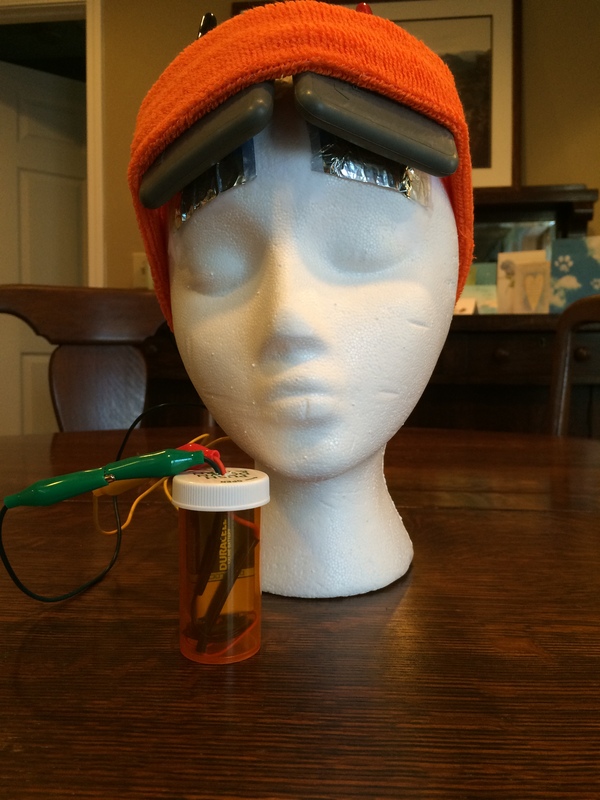 The completed tDCS device is shown with my “test-head” (above), complete with electrodes and a head-band. The tDCS device was constructed in about 30 minutes. Total cost for the tDCS device and wires was about $5. The cost of electrodes varies from about $1 dollar up to $30 dollars depending on the type selected and the supplier. A mass-produced equivalent of this setup could be used prevent thousands of suicide deaths every year – each device, electrodes, and headband costing less than a months supply of anti-depressant pills. Are you paying attention WHO? What I want to know is, *how many* years? The options available for mental health are still almost hilariously limited. I agree, the WHO’s goal is completely unattainable unless devices such as these make it to the doctor’s office soon. I don’t know how long it will be till FDA approval comes along – for a device with a reasonable price.